Rachel — who lives with her nine children at the Gateway Inn, along San Ysidro Boulevard — was served with a lawsuit yesterday. She is being evicted, but has nowhere to go. She is being told by other residents that the manager might turn off the lights and water soon. You may remember how back in August, residents of the Gateway Inn received 60-day eviction notices. The building, which some have called an “abomination” due to its terrible conditions, had criminal misdemeanor charges filed against it in February 2015. The complaint cited five violations, including failure to keep the property free of waste. The owner, listed in public documents as Francis Lin, submitted a permit to the City of San Diego to demolish the two-story hotel. In a new phone interview, Rachel explained that many tenants are still living at the Gateway Inn, despite the eviction notices. She tried to give the managers her rent today, but he refused to take it. Robert “Duke” Valderrama was appointed to his 4th term as National City’s port commissioner. A long-time National City resident, he works to get residents better access to the waterfront. Read more about his vision in the San Diego Union Tribune. About two weeks ago, I received a mysterious bulky letter in the mail. The label was addressed to my home, but had “South Bay Compass” as the addressee. The envelope had no name on it and no return address. It looks like Voice of San Diego received the same information. Reporter Maya Srikrishnan wrote the story. Basically, Morgan Square Inc. did not provide National City with required financial reports. 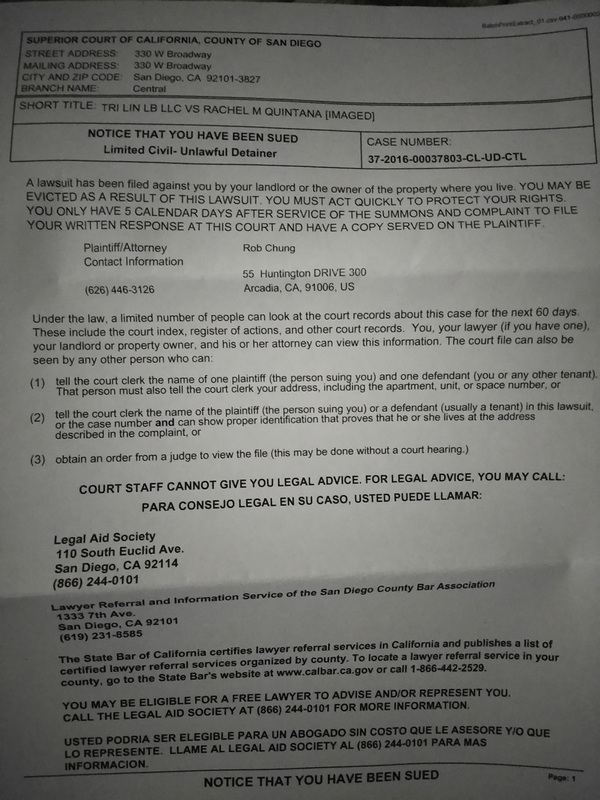 National City then sued and the company owed $250,000. Ditas Yamane was a bookkeeper for the company and now is running for City Treasurer. Her opponent, incumbent Mitch Beauchamp, has had his own run-in with the media. A former National City councilmen, in 2009 the San Diego Union Tribune article reported he was suspended from the Sweetwater Authority board of directors “over allegations he was deceitful and disruptive.” Another article reported former San Diego City Attorney Mike Aguirre representing Beauchamp in the case, saying the board members who accused him may have been violating the Ralph M. Brown Act. Oh no! Silver Medalist Sam Willoughby, a BMX athlete who trained at the Olympic Training Center in Chula Vista and won a silver medal in 2012, suffered a very serious spinal chord injury. His fiancé is Alise Post who took silver in the Rio Olympics. Sam needs extensive physical therapy and the costs are high. This article describes what happened and asks for donations. In a follow-up interview with Manny Rubio, the Director of Communications at Sweetwater Union High School District, I asked why Eastlake High School received a brand new amphitheater last year — but Bonita Vista High School did not. He explained that the amphitheater for Eastlake High School was actually a part of the original plan done for the school about thirty years ago. There was also an observatory planned that still hasn’t been built. There is an additional round of bond money that slates Bonita for some work to be done starting this year. There’s been talk for a long time about Bonita having their own stadium. Their own athletic field. So the district is looking at putting in lights for Bonita’s athletic field. They’re putting out some information to the community about that. KPBS interviewed Steve Padilla (D) and Jason Paguio (R) in their run for CV City Council District 3. Meanwhile, the media has been reporting about — how shall I say? — their warts. The Chula Vista Star News also interviewed Jason Paguio. The article mentioned that he originally stated in his ballot he was an educator but after a challenge to the statement he removed that designation. Back in August, Russ Hall, writing for the Star News told of how Steve Miesen used his 501c3 foundation through email communications to promote his possible selection to the vacant city council seat. (The IRS prohibits 501c3 non-profits from engaging in politics.) Jason Paguio somehow got a copy of the email and sent it along to the council, presumably as a way to cite an infraction. Then, when Jason became an aid to Miesen, nothing was ever heard of the issue against. Finally, Channel 10 reported this week that the San Diego County Gun Owners sent a mailer with a man taking aim and appearing to shoot. The mailer endorsed Jason Paguio (as well as Mike Diaz who is running in District 4). The news interviewed Southwestern College Governing Board trustee Griselda Delgado who was outraged by the mailer. The 10 news brief also mentioned that Steve Padilla and Rudy Ramirez are gun owners, but support stricter gun laws. There’s been increased traffic along the SR 75, but it’s likely to increase after the construction of the expanded Navy Campus. (Eagle & Times) The San Diego Reader reported even more on the topic. Tijuana Innovadora, the biennial mega-conference starts next week. The event showcases emerging tijuanenses — fashion designers, exceptional chefs. You MUST follow the developments. Find out more from SD Union Tribune’s Sandra Dibble. The binational art scene is flourishing. The New York Times this week has a piece on Marcos Ramírez and David Taylor. « What’s in Our Mailbag?